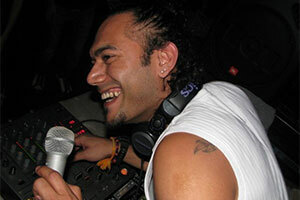 Featured early in his game as DJ’ing prodigy in the R.A.V.E magazine’s debut year 2002, he was dishing tricked out tunes to crowds, playing at probably all the talked-about and popular dance floored venues in Bangalore, Mumbai, Hyderabad, Chennai and Goa, unleashing sets in their full glory. A patron of electronic music, Deej has been a versatile virtuoso playing all its sub genres including house, tech, progressive and trance. An aficionado of Disc-Jockeying’s technical nuances, he was the winner of the South Zone DJ Championships four times over. He shared his gift and skill guest-lecturing in various production schools in Bangalore and Chennai and was in-house faculty at the Denon School of DJ’ing. He took to production under pseudonyms- Delaflame and Pavaka. He has originals, licensed and released with collaborations with international record labels such as Times Music, LAD Records, Hot Fish Records and Twizted Lotus. He has released also a number of remixes for established artists like Shuba Mudgal, Mallikarjun Mansoor, Robert McFedden, Pryda, Skazi, Natalia, Anna Vissi, Synsun and Astrix. He has featured live alongside DJ big wigs such as John OO7 Flemming, Fat Boy Tim, Nasha, Vachan, Suketu, Nikhil Chinappa, Clement, X Noize, Paranormal Attack, Sesto Sento, Goa Gil, RajaRam, Kraft, Ananda Shake, Eskimo, Neuromotor, Highlight Tribe, Suntribe, Riktum, Psychovski and many more taking to stage at various venues in India, France, U.K and Thailand. In 2009, Deej graduated from SAE, Bangkok as a ‘Sound Engineer’. He currently is working on originals set to release soon. He also single handedly schools those interested in DJ’ing and production at ‘Pavaka DJ and Production School’, in his studio set up in Mysore. Although he is immersed in exploring new horizons and experimenting with detailed sounds in production, he doesn’t fail to perform and live up to his legendary repute, creating a radical experience to those who can witness his live sets.